Outsourcing Of Electronic Medical Records to INDIA? 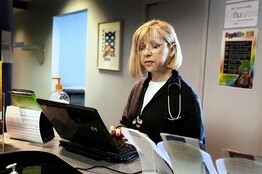 Getty Images U.S. health providers will get incentives to adopt electronic records. Indian technology companies are eyeing a coming wave of U.S. spending to digitize health-care records. But sensitivity over outsourcing and resistance by American hospitals to sending medical information overseas could thwart efforts to win big contracts. The U.S. government next year will begin to dole out billions of dollars to health-care providers who adopt electronic medical records. Doctors also face a federal mandate to upgrade software as the U.S. switches to a new system of insurance billing codes. For Indian companies with experience in software outsourcing, the flurry of health-related tech spending in the U.S. is “like another Y2K opportunity,” says Pradep Nair, head of the health-care practice at New Delhi’s HCL Technologies Ltd., referring to the turn-of-the-millennium computer glitch that provided work for Indian tech firms. But cashing in on what Forrester Research expects to be a nearly $50 billion U.S. health-information market in the next two years won’t be straightforward for Indian companies. While they have had success handling outsourced work for pharmaceutical companies and insurers, Indian companies have struggled to win business from U.S. hospitals, which will do the bulk of new health-tech spending. Nishant Verma, vice president at Bangalore outsourcing firm Tholons Inc., says U.S. hospitals still haven’t crossed an “emotional barrier” when it comes to sending tech work overseas. “Though it is never said overtly, it is much harder for Indian suppliers to get these kinds of contracts than their American counterparts,” he says. Hospitals say they have practical reasons for being reluctant to work with offshore vendors, citing the efficiency of doing work on site and the potential legal complications of shipping sensitive health information to other countries. Competition for health-technology contracts is fierce. Just about every major U.S. tech vendor, including IBM Corp.,Xerox Corp., Dell Inc. and Accenture Ltd., is pursuing the market aggressively, says Forrester’s Andrew Bartels. Still, if Indian outsourcing companies aren’t successful at getting health-care business, skeptics in India could perceive that as another slight to an industry whose relationship with the U.S. is becoming increasingly tense. A U.S. law enacted in August increased visa fees for skilled workers, pinching Indian companies who send workers from cities such as Bangalore and Hyderabad to work in the U.S. In India, the law was seen as protectionism. Dealing with that dynamic is among the challenges U.S. President Barack Obama faces on an upcoming visit to India from Nov. 6-9. One reason for the projected growth in U.S. health-care IT spending is a federal mandate that hospitals and private physician practices show “meaningful use” of electronic records or risk losing federal reimbursement for medical care. Only about 20% of U.S. hospitals currently have electronic health records. A typical 500-bed hospital will be eligible starting next year to receive $6 million for implementing digital health records, according to a June report by PricewaterhouseCoopers. But if the hospital doesn’t act by 2017, it would lose as much as $3.2 million a year in Medicare funding. Indian companies are hiring in the U.S. to counter charges that their businesses hurt U.S. employment and to enable themselves to do more onshore work for clients. HCL has about 2,400 American employees and a large software center in Raleigh, N.C., Mr. Nair says. The company generates about $250 million in revenue a year from U.S. pharmaceutical and insurance providers and is seeking medical-records and insurance-coding business. Clients can have work done in HCL’s U.S. development center. But “if they want to reduce the costs more we can deliver out of India,” Mr. Nair says. It also helps to have headquarters in the U.S. Cognizant Technology Solutions Corp. is based in Teaneck, N.J. but has most of its staff in India. The company expects to generate about 25% of its estimated $4.55 billion in revenue from health care this year and is developing an electronic medical-records system for U.S. hospitals. It also expects to win business from insurers coping with requirements under the new health-care overhaul that will bring an estimated 32 million uninsured Americans into the system in coming years. The overhaul also requires states to make major technology investments to set up insurance exchanges. Indian tech giants Infosys Technologies Ltd., Wipro Ltd. and Tata Consultancy Services Ltd., say they’re also gearing up for health spending. Some health-care providers are reluctant to send some patient information overseas, however. “As soon as it leaves the confines of the U.S., it’s not subject to the same rigorous laws as we are,” says George Conklin, chief information officer of Christus Health, an Irving, Texas, operator of more than 40 hospitals in six states. He says he has sent offshore only management of a small number of systems that strip out personal information, such as one that hospital staffers can use to identify departmental trends. Indian outsourcing companies reply that they adhere to the same level of information security as their U.S. counterparts do. U.S. health-care executives have other hesitations about hiring Indian firms. Designing and installing new medical systems “is hard to do off site, let alone offshore,” says Darren Dworkin, chief information officer of Cedars-Sinai Medical Center in Los Angeles. Cedars-Sinai is close to finishing a four-year, $100-million project to install an electronic medical-records system. Mr. Dworkin says that 80% to 90% of the work isn’t the sort of commodity coding that is easily outsourced, instead requiring an intimate knowledge of the hospital’s terminology and how its doctors and nurses work. Ardent Health Services LLC, of Nashville, Tenn., is eight months in to a project to bring its systems in line with government standards. Mark Gilliam, Ardent’s information chief, says he relies on companies in the region that have a history of working with hospitals. There’s enough work, however, that he’s also talking with offshore providers to see if work such as quality checking and support can be parceled out.